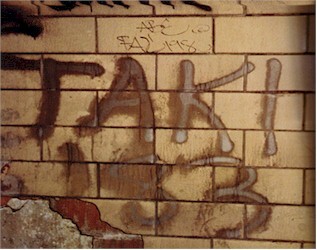 Graffiti has always existed. Only it used to only exist in private places, like rest rooms. I used to go see my dad at his job at the Santa Fe train station in San Bernardino in the 1970s. The station was built in 1917 and had Tennessee marble walls dividing the stalls that had graffiti whose earliest dates (and the writers did date their work) were between 1919 and 1921. Most of it was about people of different races and flatulence. And, for the most part, it was rude but it wasn't profane. I've always loved watching trains, and now it's rare to see a frieght car that isn't covered in graffiti. Who is doing this and how is it done? And why do they all look like they were done by the same person? I think it's disgaceful.